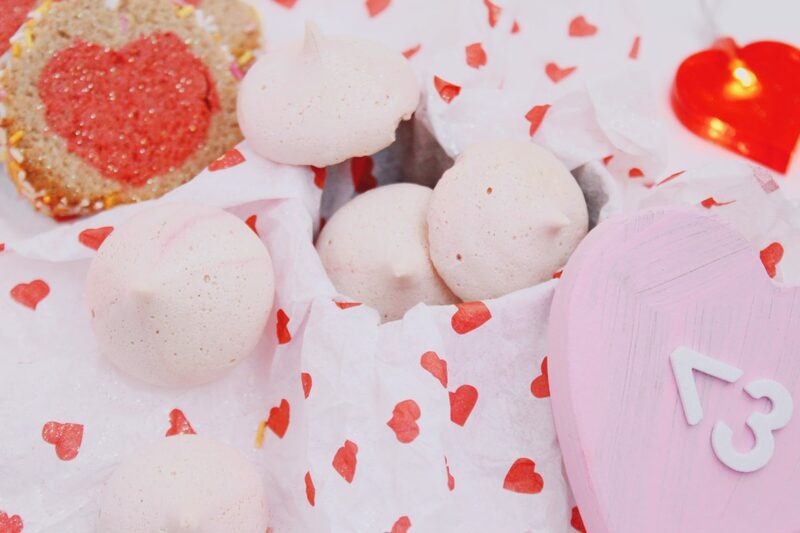 Last year, we tested out three pinterest-popular Valentine’s Day craft ideas. 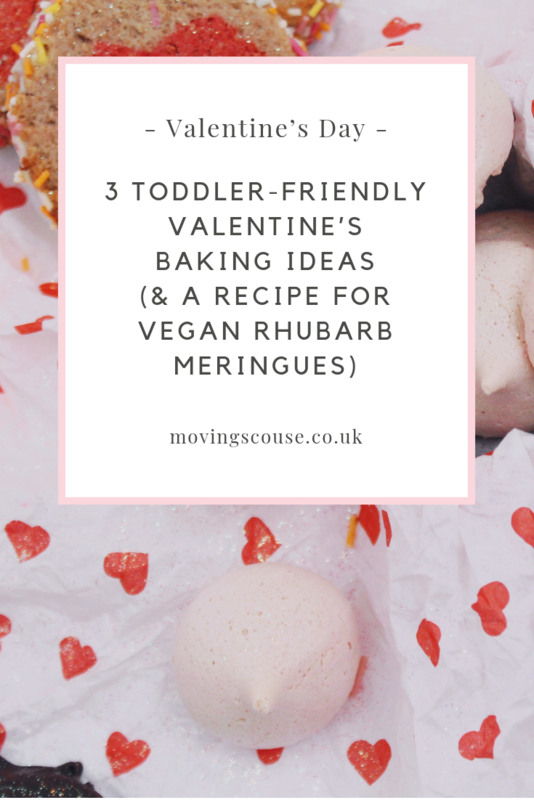 This year, we’re back, testing out toddler-friendly and vegan Valentine’s baking ideas from, you guessed in, pinterest. Like so many others out there, I’m a bit pinterest-mad, and there’s nothing like a holiday/occasion board! I have a valentine’s day board that I’ve been pinning to for years, and it’s SO easy to just keep cataloguing ideas and not ever trying any of them in real life. Last year I decided that this wasn’t a useful way to spend our time, and so we’ve been making an active effort to try a handful of ideas for every possible occasion. 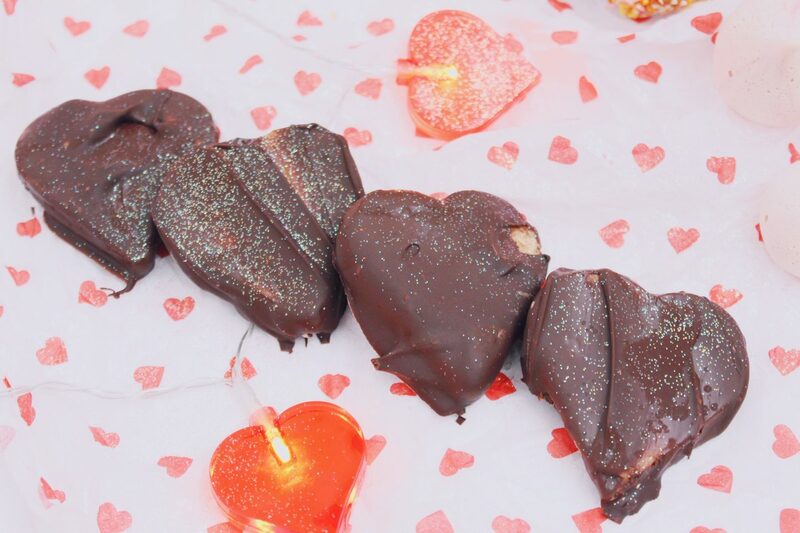 Since I had a day off on Friday, we had a go at some vegan valentine’s baking ideas. I chose a few that looked easy enough so that Isla could help, and we tested them for both taste and toddler-friendliness! Ever since the dawn of aquafaba, making vegan meringues has been pretty low-effort. I saw this inspiration for pink meringue kisses, and just knew we’d have to include these! 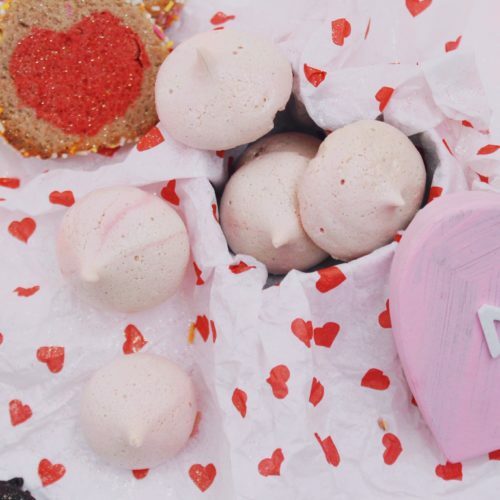 Since the recipe in question is a traditional, non-vegan one, I went with my usual meringue recipe and made it valentine’s friendly! While aquafaba meringue is a bit fragile and I’ve heard of some recipe fails when using colours and flavours, I’ve never experienced any issues. In this recipe, I used Foodie Flavours Rhubarb flavouring* as well as Sugarflair Food Colouring Paste* in Claret, and they worked perfectly. This is quite possibly one of the easiest recipes to make with kids – they can help chuck everything in the mixer, and, with a bit of help, they can do the piping, too! Preheat your oven to 100ºC and line a tray with baking paper. In a stand mixer, whisk the aquafaba and cream of tartar until stiff peaks form – this takes about 10 minutes. With the mixer on medium speed, add the sugar tablespoon by tablespoon. Once the sugar is completely incorporated, add in the food colouring and flavouring and mix until completely smooth and uniform in colour. Add mixture to a piping bag with a large round nozzle and pipe kisses onto the baking sheet. This works best if you hold the nozzle about 3/4 of an inch above the sheet. Bake for an hour. These absorb moisture from the air really easily, so they’re best served fresh! There’s literally nothing better than chocolate and peanut butter in my opinion! After seeing this inspiration, I just had to try a seasonal version of everyone’s favourite US candy. It wasn’t hard to veganise, all we had to do was swap the butter for margarine, but I did really struggle with the chocolate coating. That’s why they kind of look a mess in the photo :D. Apart from that final step, these were quite easy to make. Again, there’s lots of throwing things in the mixer, rolling out dough, and cutting out shapes involved, so it’s a really family-friendly activity! 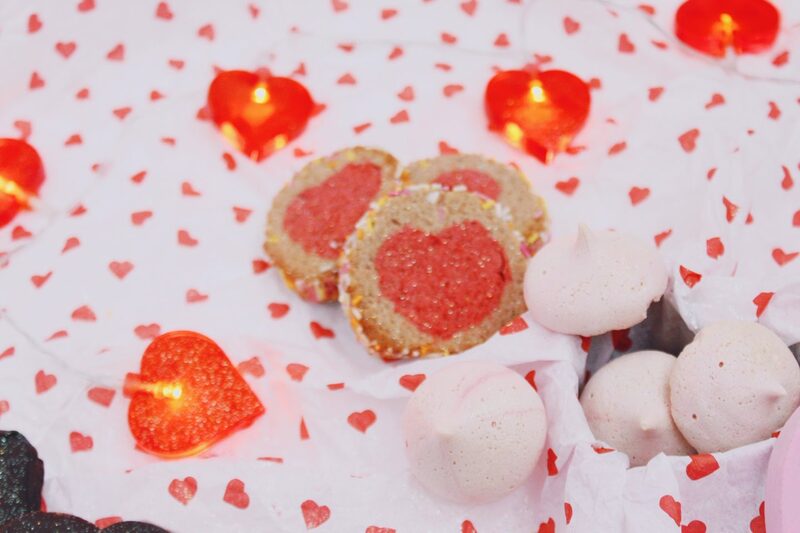 Our final vegan valentine’s baking project was the famous slice-and-bake cookie. We used this as inspiration, but opted for an Oh She Glows Sugar Cookie recipe to add at least SOME nutritional value into this afternoon. Using a more conventional cookie recipe might have made this look a bit better, but overall I’m actually quite pleased with how they turned out. I thought the whole thing was going to be a mess, but it was quite straight forward! In fact, I think this might have been our favourite of the three, and now I’m planning to make an easter-egg version in April! 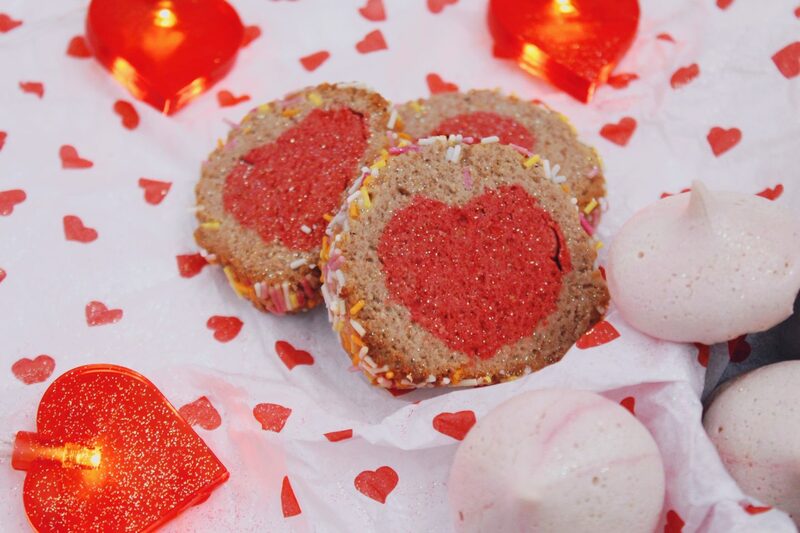 Are you doing any vegan valentine’s baking this month? If so, please do share your plans in the comments!